Iconic Noodle Celebrates 50th Anniversary On Aug. 25, 1958, the first package of Chicken Ramen was sold in Japan, making today the 50th anniversary of the iconic instant meal. Momofuku Ando was much more than just a noodle inventor — he was a philosopher, too. 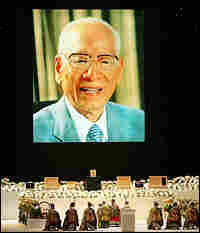 A large portrait of Momofuku Ando, inventor of instant noodles, is projected during his funeral at the Kyocera Dome stadium in Osaka, Japan, Feb. 27, 2007. In January 2007, media the world over noted the passing, at age 96, of Momofuku Ando, the inventor of instant ramen. When I found out that Ando's funeral would be held at a baseball stadium in Osaka, I used frequent flier miles to get there. Everyone there was in black suits and ties. Inside, the stadium had been decorated to look like outer space. Blue lights twinkled in the bleachers, and galaxies twirled on video monitors. Six thousand people sat in the dark on folding chairs facing the home run wall, where rows of Buddhist monks framed a long white stage. The theme was an homage to Space Ram, the instant noodle that Ando developed for astronauts, but also to Halley's Comet, which showed up in 1910, the year Ando was born. Ando had brought ramen from the heavens, and now he was returning home. The funeral included speeches by prime ministers and chanting by the monks, but there were also goodie bags. Each attendee received a five pack of Chikin Ramen, a container of Cup Noodles, and a book of Ando's famous sayings. I happened to be struggling over whether to begin a career as a writer. Then I read the first saying in the book: "I invented instant ramen when I was 48 and Cup Noodles at 61. In life, there is no such thing as too late." A few days later, after I flew home, a friend asked if she should leave her boyfriend. Unsure what to say, I opened Ando's book. One saying was related to his failure to sell a product called instant rice. "When you enter a market," Ando had written, "do it slowly. When you withdraw, do it quickly." My friend was single the next day. Soon all my friends wanted advice from the inventor of instant ramen. "Flavors taste best to those who appreciate them," I counseled one. "Food is balance," I instructed another. Still, some of the sayings were downright cryptic. One friend asked, should I propose to my girlfriend? I answered with Ando's most famous utterance: "Mankind is Noodlekind." We debated what Ando meant by that, and eventually decided he meant my friend should propose. Then we cooked and ate the entire Chikin Ramen five pack. This year, instant ramen demand is expected to surpass 100 billion servings worldwide. Thank you, Momofuku, and not just for the noodles. Andy Raskin is the author of the forthcoming book The Ramen King and I: How the Inventor of Instant Noodles Fixed My Love Life.